New Deer (Scottish Gaelic: Achadh Reite) is a settlement in Aberdeenshire, North East Scotland that lies in the valley of Deer. It was founded after monks from Deer Abbey, Old Deer built a chapel at Auchreddie, which translates as "field of the bog myrtle". Around 1507 the register of Deer Abbey lists its lands in the "new paroche of Deir". 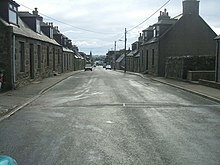 The name Auchreddie has dropped in significance over the years, however the southern end of the village is still known by this name. In 1805 New Deer was extended to the north by the third James Ferguson of Pitfour (1735–1820), the elder brother of Patrick Ferguson. There are three churches in the village, only one of which (St Kane's) still functions as a religious establishment; it belongs to the Church of Scotland. One is now used as a gym hall of the primary school and the other has been[when?] built into flats. In 2014 Mintlaw Community Church as part of an outreach to the community started to hold a weekly Sunday Morning Service in former church building in Main Street. St Kane's opened a church centre in 2003, next door to the church. The building was previously a long-running local general store and accompanying house. The centre includes a café and is used for various community activities. New Deer (St Kane's) Primary School sits behind the main church, in the centre of the village. The public hall, opposite the church centre, is run on a not-for-profit basis and hosts various activities including parent-and-baby groups and exercise classes, as well as being a venue for theatrical productions. 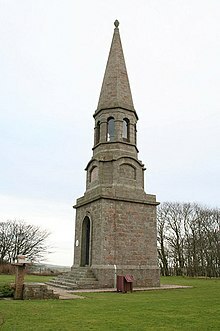 Stands on a hill to the north of the village and commemorates William Dingwall Fordyce. Local Brucklay estate landlord, Fordyce was an Aberdeenshire MP. Constructed in 1877, the monument is 80 feet (24 m) high and was designed by James Matthews. Situated at the highest point in New Deer, 150m above sea level, it is prominent on the skyline on all major approaches to the town. Historic Scotland designated it as a Category B listed building in April 1971. The ruins of Fedderate Castle are to be found 3 kilometres (1.9 mi) north of the village. New Deer is currently host to three public houses, the Brucklay Arms on Main Street, the Howe (Earl of Aberdeen Arms), situated on Auchreddie Road East and the Royal British Legion, opposite St Kane's Church. There has been a bank in the village since at least 1847. For many years this was the Clydesdale Bank until 2006 when the Royal Bank of Scotland took over the branch. Historically the New Deer Savings Bank (est. 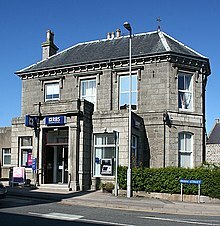 1847, and which became part of Trustee Savings Bank (TSB) in 1863), also provided a service to residents, but TSB left the village in the 1980s. The villagers' successful campaign against the removal of banking facilities was partly responsible for it winning the "Calor Gas Scottish Community of the Year" award in 2006. The Grampian Wildlife Rehabilitation Trust provides help to various wildlife including seals. After local consultations and fundraising spanning 10 years, during April 2013 construction began on New Deer All Weather Facility at the village's play park. The first stage was building a storeroom and changing rooms. Other amenities in the village include builders, butchers, seasonal café, doctors, pharmacy, general grocery stores, hairdressers, photographer, post office, delicatessen and vets. The New Deer Show is an agricultural show that has been running for over 150 years. Other annual village events include a gala and a barn dance. Bertie Charles Forbes (1880–1954), was born and buried in New Deer. Alexander Falconer Murison (1847–1934), professor and journalist. William Fordyce Mavor (1758–1837), educationalist, was born in New Deer. J. Murdoch Henderson (1902-1970), fiddler and composer, born in New Deer. In the early 19th century a local miller named John Fraser had a reputation of being in league with the Devil, who was said to operate the mill for him. ^ a b c "New Deer". Archived from the original on 5 February 2007. ^ "Welcome to St Kanes". St Kane's Church. Archived from the original on 11 February 2014. Retrieved 11 February 2014. ^ Historic Environment Scotland. "Hill of Culsh (Dingwall Fordyce) Monument (Category B) (LB16156)". Retrieved 27 March 2019. ^ "The BBAF art in the environment database". Banff and Buchan Arts Forum. Archived from the original on 11 February 2014. Retrieved 11 February 2014. ^ "New Deer bank to open this month". Buchan Observer. Archived from the original on 11 March 2007. ^ "Records of New Deer Savings Bank". Glasgow University Archive Services. Archived from the original on 25 December 2005. ^ "Rare owl saved by worker on oil rig". The Owl Pages. Retrieved 10 February 2014. ^ "New Deer all-weather scheme nears completion". Inverurie Herald. 7 November 2013. Archived from the original on 11 February 2014. Retrieved 10 February 2014. ^ "MP shows support for New Deer's All Weather Facility". Buchan Observer. 3 October 2013. Archived from the original on 11 February 2014. Retrieved 10 February 2014. ^ "New Deer Show". New Deer Show. Retrieved 10 February 2014. ^ Ash, Russell (1973). Folklore, Myths and Legends of Britain. Reader's Digest Association Limited. p. 465. ISBN 9780340165973. Wikimedia Commons has media related to New Deer.